With simple Music Flashcards you can get your students remembering Note names, technical names and those dreaded Italian terms! Best of all – you can make it FUN! I remember the first students I took through examinations – I remember it like it was yesterday! I just got back a blank look. Whoops! I think something’s been missed somewhere in this student’s education! Of course I spent an extra hour or so with this particular student and they got through alright, but it taught me a very valuable lesson about how students learn. I could of course blame their theory teaching, the school system or the parents… but I can’t do that. The student needs to know these things, and it is my responsibility to make sure that they know it. I then started using flashcards in my lessons. I just made some simple ones that matched the various notes and symbols that the children needed to know for their exams. It became a game – I simply showed them each card, and they had to answer within two seconds or they’d lose a point. It was great fun, even for older children who I thought would be past games. They loved it, and it was part of the routine. It took less than one minute per lesson to quickly run through five or six general knowledge concepts that they had to know, and it resulted in them always getting 100% in the general knowledge section of their exams. My flashcards were pretty primitive – I simply wrote the symbols on pieces of card and covered them with clear plastic. When I married my husband we started creating our own flashcards on the computer. My husband also taught theory, so we developed hundreds of different cards that suited the various teaching situations. 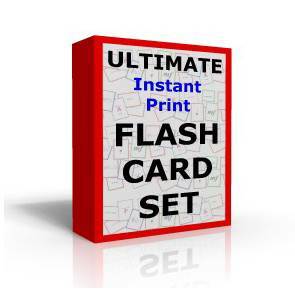 In the Ultimate Instant Print Flashcard Set you get a comprehensive selection of printable flash cards that you print yourself, right from your computer. If you got cards pre-printed you’d have to worry about losing them – the box would end up looking pretty tired and used and you’d have to constantly sort through a whole heap of cards that you might never use. Just think – Wouldn’t it be great if you could go to your computer and print out exactly the set of flashcards you needed for a particular student, and you can pop a rubber band around them and keep them for just this student? Then, next time you see this student you’ve got their flashcards all ready for them. Alternatively you can print out all the cards and organize them into your grade or examination levels that you need. That way, whenever you have a student doing a particular grade you can pull out the appropriate set. Its impossible to do this with a pre-printed set of cards, as there is likely only one or two of each card!, not enough for each grade to have everything. Completely Self Checking cards – means the students can test themselves! Each card in “The Ultimate Flashcard Set” is designed so that you simply fold and glue them together, and the answer is on the back! All pitches from Bass Clef C (2nd Space) through to Treble Clef C (3rd Space). All Clefs including Treble, Bass, Tenor, Alto, placed on a stave so that you can see their correct positions. All key signatures in the treble and bass clefs, up to seven sharps and seven flats. On the back is both the Major and Minor Keys they represent. These have both the European time Name (Crotchet, Quaver etc) AND the American Time Name (Quarter Note, Eighth note etc), so you can use whatever terminology you wish. The concept is that you don’t have to print the whole lot – you print what you need. Don’t worry if you aren’t teaching these things – you might one day, and you’re students may well have to know the difference between the sign for an upper or lower mordent. Thanks to our unique get what you need guarantee (please read below) we intend to supply the most comprehensive set of instant print music flashcards available anywhere. Anyone who has ever done any examination, particularly a theory examination knows that you have to learn a LOT of Italian terms. Every examination system (Trinity College, ABRSM etc) has a different requirement, and so we did not make this set for any particular group, rather we have combed the syllabi for ABRSM, Trinity College and the AMEB (Australia) to include every single term we could find. This is a dynamically growing list, and as teachers email in their requirements for the different students they have the list is sure to grow. Our Unique “Get What you Need” Guarantee means that this flashcard set will become the most comprehensive set of flashcards available, and the best bit is that it is controlled by YOU, the teachers who use it in lessons. At the Fun Music Company we want “The Ultimate Flashcard Set” to be the most comprehensive set of instant print musical flashcards available on the internet. If you require a musical symbol, an Italian term or another musical concept which is not included in the flashcard set all you have to do is email The Fun Music Company and we will create it for you, and add it to the set. Its not a bother to us to create it, as it will add value to the set in the long term for all the teachers using it. This way, in the long term we will be sure to have a complete set of every term that is required to teach music, anywhere in the world. You also get lifetime access to updates and revisions, which means that if additional terms are added to the syllabi you are using, you simply can email us and we’ll create new cards and add them to the set. Not 30 Days, but extended to 90 Days for complete peace of mind! At the fun Music Company we stand behind everything we sell. 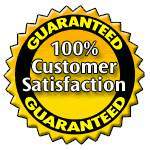 If for whatever reason you decide that you aren’t satisfied with your purchase we will of course refund your money – all you have to do is let us know within 90 days why you feel the purchase is unsuitable. Yes you can do that If you wish. It depends on how much you value your time. It can take anywhere from ten minutes through to a number of hours to make flashcards, design the borders and make sure they print correctly. To make hundreds of flashcards will take you many hours work, and I’m offering this entire set to you for the ridiculously small investment of just $19.95. If you value your time at all you will quickly see that this small amount of money will save you many hours preparation time – You simply come back to the members only website and print out what you need, when you need it. For around the cost of ONE MUSIC LESSON you can have access to all these instant print flashcards, and you can print them out straight away from your computer. If I had been able to find something like this when I was teaching it would have saved me many hours of frustration trying to learn how to create a good flashcard on the computer, and probably hundreds of hours work. So do yourself a favor, get started straight away with the Ultimate Flashcard set by clicking the button below. You will get immediate access to the materials, and you’ll have lifetime access to all the updates. So go ahead, you have nothing to lose, except perhaps the hundreds of hours work that it will cost you if you DON’T get started now with the ultimate instant print flashcard set! I really want you to make it fun for your students to learn their general knowledge, and you can do with flashcards like these! This is by far the easiest way to order your instant print flashcard set from the Fun Music Company. Our online ordering system is the most safe and secure available, secured through 1shoppingcart and the payment gateway Eway. When you go to the order form you’ll be able to see the secured “lock” in your browser so you’ll be confident that you’re credit card details will be 100% safe and secure. P.S. Make sure you take your chance to get these cards now, as I can only guarantee this price for a limited time! P.P.S. These flashcards are FREE as a bonus with our Printable Music Games package.Click Here to find out how you can grab them FREE with 20 games for music lessons. P.P.P.S You have absolutely nothing to lose, as our guarantees mean that if you need flashcards for music lessons you’ll get what you need with this product!